上海生煎包 Shanghai Sheng Jian Bao Shanghainese Pan Fried Steamed Buns is a local snack that originated from Shanghai in the 1920s. The novel way of pan frying the mildly proofed buns before steaming them directly in the same flat pan over a stove became extremely popular as a street food and remains so in Shanghai today, alongside 小笼汤包 Xiao Long Steamed Dumplings and other delectables in Shanghainese cuisine also known as 沪菜 or 本帮菜. 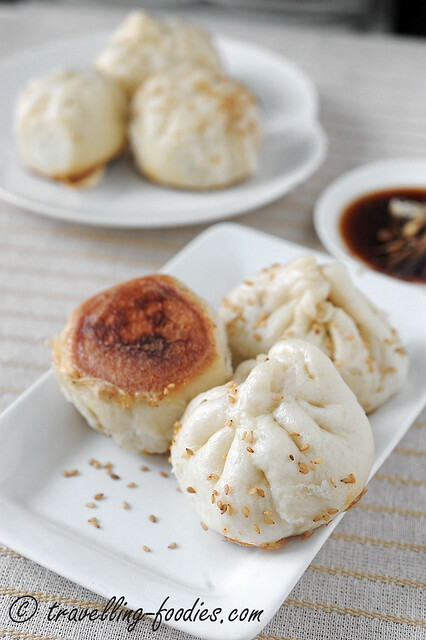 Cuisines from other places in China like the neighbouring Zhejiang (浙菜), stretching northwards to Shandong (鲁菜), or southwards to Guangdong and Hong Kong （粤菜） also have very similar versions, where these buns may also also known as 水煎包 Shui Jian Bao. The culture of eating these Pan Fried Steamed Buns spread to Taiwan during the mass exodus of Chiang Kai Shek’s KMT army from China to the island state in the late 1940s. A large portion of Chiang’s troops are from the Yangtze region, especially those from his hometown, 奉化 Fenghua in the Zhejiang Province 浙江省. These soldiers, together with those from Shandong, Szechuan and even Yunnan, forms up a large part of Taiwan’s migration population in the last century to become what the locals grew to call 外省人 Wai Sheng Ren. The influx of these soldiers and their families from Mainland China greatly diversified the social habits and culinary cultures in Taiwan. Many of these dishes brought along and introduced by these migrants became so deeply rooted, that they are now enjoyed by the tourists, as well as the Taiwanese, be it the locals 本省人 Ben Sheng Ren, or the 外省人 alike. 上海生煎包/水煎包 is one of those popular snacks.